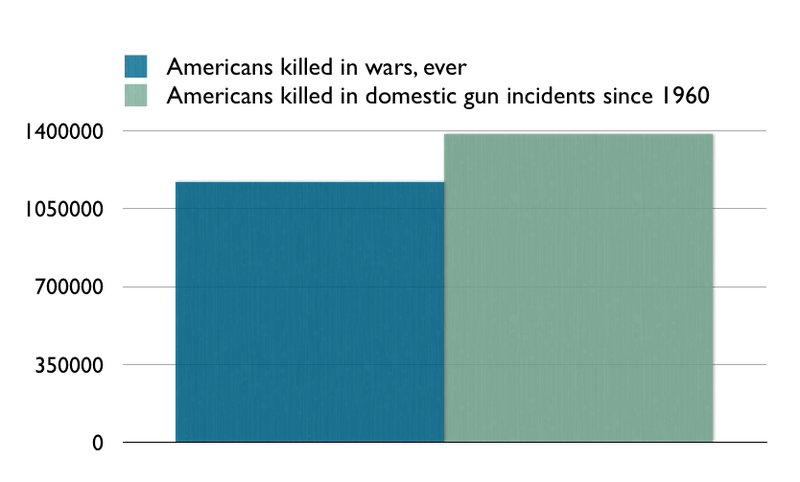 More Americans have been killed in domestic gun incidents since 1960 than Americans killed in wars, ever. Evidently, that statistic has been floating around the internet since the Sandy Hook incident, but I didn’t run into it until today. To be honest, I didn’t believe it. 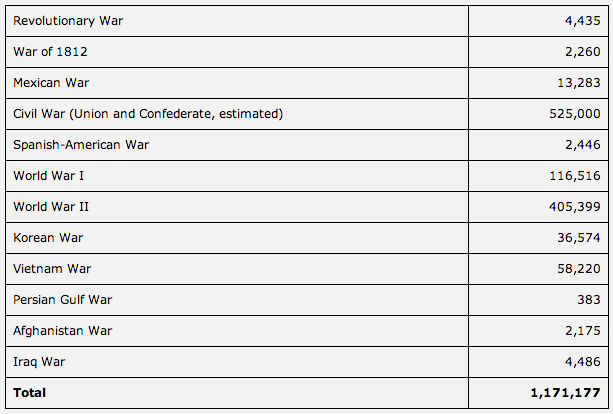 Surely, more Americans have died in all wars than in domestic gun incidents. It turns out that Mark Shields first made the claim in answer to a question from Judy Woodruff on PBS Newshour. You know, Judy, the reality is — and it’s a terrible reality — since Robert Kennedy died in the Ambassador Hotel on June 4, 1968, more Americans have died from gunfire than died in all the — all the wars, all the wars of this country’s history, from the Revolutionary through the Civil War, World War I, World War II, in those 43 years. We have half the guns that are in the world are in the United States. I mean, guns are a problem. And I think they still have to be confronted. Was Shields correct? According to PolitiFact.com, he was. Here is what they found. We found a comprehensive study of war-related deaths published by the Congressional Research Service on Feb. 26, 2010, and we supplemented that with data for deaths in Iraq and Afghanistan using the website icasualties.org. Where possible, we’ve used the broadest definition of “death” — that is, all war-related deaths, not just those that occurred in combat. We should note that these figures refer to all gun-fire related deaths — not just homicides, but also suicides and accidental deaths. In 2011, about one-quarter of firearm-related deaths were homicides, according to FBI and CDC data. Using total firearm-related deaths makes the case against guns more dramatic than just using homicides alone. Since Shields’ comparison was otherwise accurate, with about 1.4 million firearm deaths to 1.2 million in war, we rated his claim True. If that jaw dropping statistic doesn’t convince you that we have a gun problem in this country, you aren’t really interested in the facts. ← Senator Goedde Go Galt- Please! suggests that guns should be kept from felons and children (and add the disturbed). ( a straw purchase,-against the law). People died, yet the brother was not charged. Over 22,000 gun laws on the books now. so we must need more gun laws,right? And the CDC data includes all shootings by police officers,as well.